Working with a determined and visionary client, this project was complex and challenging. Three simple buildings arranged around a large open courtyard form the heart of this working distillery. Two large stone clad buildings are of traditional design. 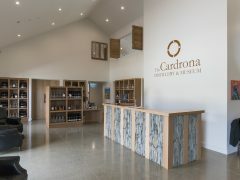 One houses the Distillery reception, cafe and tasting room, along with a large area dedicated to the history of the Cardrona Valley. The second building contains the working distillery on two floors with traditional copper stills, manufactured in Scotland. The third building contains the Barrel storage room and a bottling room. Located opposite the Cardrona Skifield entrance on the Cardrona Valley Road and flanked by 1500 damascene rose plants the buildings sit strongly, but unobtrusively in their rural setting.